Alyssum Paletta Mix Lobularia Maritima is an outstanding, quick-flowering, low-growing border plant that is easy to grow from Alyssum seeds. Commonly called Sweet Alyssum and Sweet Alison this ground cover forms a dense carpet of medium-green foliage that is covered with thimble-shaped clusters of lavender, white and purple flowers. 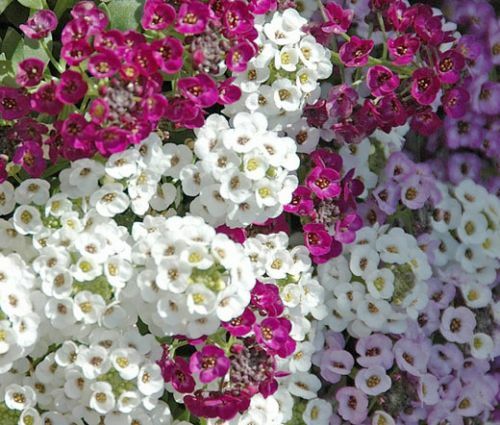 Alyssum blooms from spring until first frost, and its sweetly-scented flowers attract bees and butterflies. Alyssum Paletta Mix is a compact ground cover and superb flower for rock gardens, borders, edgings, planting between paving stones. Alyssum is a great container and pot plant. Lobularia Maritima performs best in full sun or partial shade and prefers moist, but well-drained soil.